This small-sided volleyball game takes a cooperative drill and makes it competitive with a heavy focus on defense and transition. This game, also known as Brazilian 2-ball, is a great warm-up that gets players moving and competing while also working on communication and strategy. This is a 6 on 6 volleyball drill/game that you can use to keep many players active and not sitting out for long periods of time. This fast-paced game features a lot of player movement and encourages communication and problem-solving. It's good for warm-ups or regular game play work. 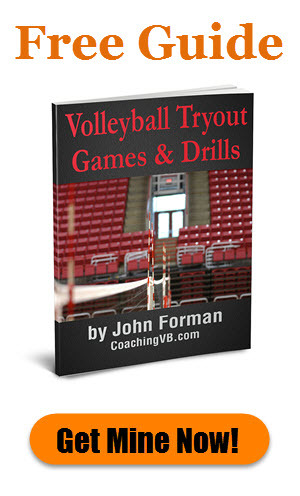 This volleyball training game focuses on attacking in a setter-out or out-of-system situation. It can be used to get hitters to make good decisions. This is a variation on the Speedball Winners game concept which puts a greater emphasis on aggressive defense, which can raise intensity levels. 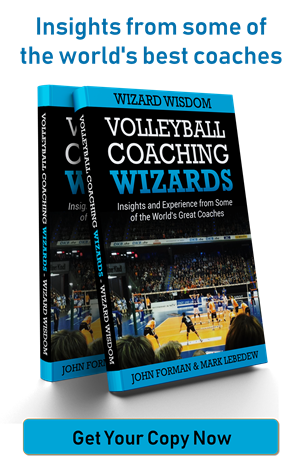 This volleyball game is a variation on Winners which channels attacks into certain areas and works a lot on out-of-system offense. This is a good small-sided game-play exercise that gets every player lots of touches and works especially on transition hitting. This game pits the OH and OPP hitters against each other in a kill challenge to work on being able to score against full-team defense.